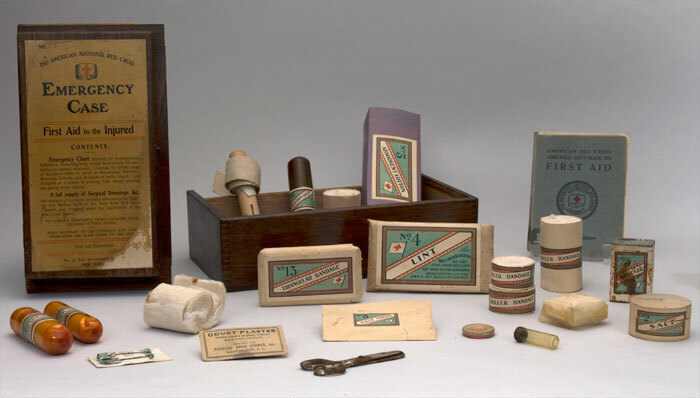 At the onset of the American Civil War, Clara Barton realized that a ready set of basic supplies was needed to aid wounded soldiers. She was determined to “render any aid possible to the weary and wounded men.” In addition to food, Barton secured bundles of “sewing utensils, thread, needles, thimbles, scissors, strings, salves, tallow, etc.,” to assist the soldiers. She worked with the military and government to ensure that soldiers and the medical staff who served them, had medical supplies, rations, clothes, and other necessities. As President of the American Red Cross, she recognized the need for supplies and aid during natural disasters, conflicts, accidents and emergencies. The first American Red Cross Emergency Cases started production in 1903. Miss Barton’s vision of teaching emergency response and first aid for the injured took shape.